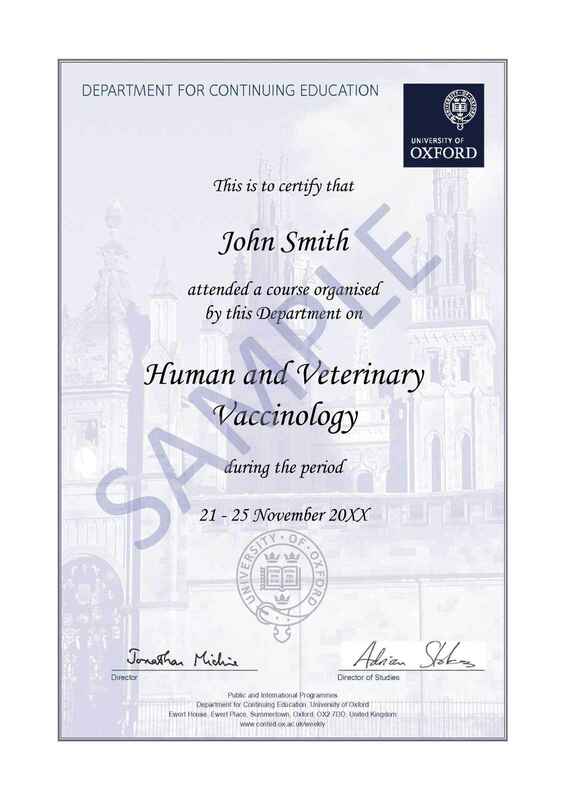 The Programme provides state-of-the-art teaching in both human and veterinary vaccinology, drawing on the experience of Oxford University, the world-renowned Jenner Institute based in Oxford, The Pirbright Institute (formerly the Institute for Animal Health - IAH) and our partners in industry. Vaccinology is a cross-disciplinary subject and the most exciting developments in vaccinology have occurred when people from diverse research, business and medical backgrounds have used their skills to collectively tackle problems in vaccine design, manufacture and distribution. Our course participants will therefore reflect the diversity of the subject and be from business, academic, clinical and veterinary backgrounds. The course will be of particular interest to research scientists, programme managers, clinical trial coordinators, nurses, physicians and veterinarians. The course will be accessible to people already working in the field or to those who wish to enter the field. Note that this is a draft timetable and may be subject to change. 12.20 – 12.45: Should we enforce mandatory vaccination? The above content may be subject to revision during the course development process. "Funding for the original course development was provided by the BBSRC, through the Modular Training for Industry Programme, and the MRC". On this course we offer a 10% discount to students in full-time higher education. To apply at the discounted rate, please contact us for details. Note: This is the tutor list from 2018 course, many of the tutors will be teaching again on the 2019 course. Rebecca Ashfield gained a first degree in Biochemistry and DPhil in molecular biology, both from Oxford University. She carried out post-doctoral research into regulation of gene transcription and Type II Diabetes, and was awarded junior research fellowships by Magdalen College and Worcester College Oxford. Dr Ashfield then worked for 12 years as a project and collaborations manager at Immunocore Ltd, a biotechnology company making protein therapeutics for cancer immunotherapy, and joined the Jenner Institute in 2013 as a senior project manager for pre-clinical malaria, working with Professor Adrian Hill. Martin F. Bachmann is currently Professor of Immunology at the Jenner Instiute, University of Oxford. Martin F. Bachmann, PhD in molecular biology was formerly the Chief Executive Officer of Saiba. Dr. Bachmann received his PhD in 1995 at the Institute for Experimental Immunology Zurich in the laboratories of Prof. Zinkernagel and Prof. Hengartner. He joined Cytos from the Basel Institute for Immunology where he was a Member in October 1999. He has published over 100 articles in internationally renowned scientific journals. His achievements were honored with two ETH Medals (1991 and 1995) and the Pfizer Prize for Immunology (1998) and he is laureate of the 'Swiss Technology Award 2004'. Dr Charleston obtained a BVetMed from the Royal Veterinary College, University of London, UK in 1982. After a period of time in Large Animal Practice, studied for a Masters degree in Molecular Biology at University College London in 1988, then a PhD degree, as a Wellcome Trust Scholar, from the University of London, UK, in 1991. He then carried out postdoctoral research, as a Wellcome Trust Post-doctoral fellow, at the Royal Veterinary College and the Babraham Institute, Cambridge for three years. He joined The Pirbright Institute (formerly the Institute for Animal Health) in 1994 and focused on studies of the immune response to viral infections in cattle. In addition, he has provided advice and expertise on the design of infectious disease challenge models for a wide range of pathogens in important agricultural species. His research group is based at The Pirbright Institute in Surrey; the group’s efforts are focused on understanding the immune response to Foot-and–Mouth disease virus in cattle to develop novel vaccines. Nicolas Collin holds a Doctorate in Veterinary Medicine from the National Veterinary School of Toulouse, France, and a PhD in Molecular Microbiology from University Paul Sabatier of Toulouse. He worked as project leader in the biotech industry (Transgene) then did a visiting fellowship at the National Institutes of Health (NIH) in Washington DC, USA, where he worked on vaccines against canine Leishmaniasis. In 2008, Dr Collin joined the World Health Organization Headquarters (Geneva, Switzerland) as technical officer on influenza vaccines. During the pandemic influenza of 2009, he served as coordinator of the WHO pandemic H1N1 vaccine task force. Dr Collin has been leading the Vaccine Formulation Laboratory (VFL) at University of Lausanne since its inception in 2010. Created under the auspices of WHO, the VFL is a platform providing access to adjuvants and formulation expertise for the scientific community, with a special focus to the public sector and Under-Resourced countries. Wendy gained a first degree in Biochemistry and Chemistry and PhD in Biological Surface Science, both from the University of St Andrews University. She then went to work for the Royal Society of Chemistry as an Editor and Communication Specialist. In 2009 she moved to Moscow (Russian Federation) to work as an EC-sponsored technical diplomat working in counter-bioterrorism and counter-WMD for the global security department of the International Science and Technology Centre. Then in 2012 she moved to Tbilisi (Georgia) to work for Battelle Memorial Institute coordinating a country-wide public health and veterinary initiative sponsored by the US Defense Threat Reduction Agency to achieve full operational capability of preparedness systems against especially dangerous pathogens. She presently works for Prof Adrian Hill at Oxford University on vaccine development projects for malaria and emerging pathogens. Dr. Desai received her Medical degree and Masters degree from the University of Toronto, Canada. She completed her post graduate training in Pediatrics and Infectious Diseases. Her research has focused on the impact of vaccine preventable diseases and using research to guide policy. She currently works in the Policies and Strategies Team at WHO. My undergraduate degree was in Molecular and Cellular Biochemistry at Trinity College, Oxford University, and included research projects at the Institute for Hormone and Fertility Research in Hamburg, Germany, and at the Weatherall Institute of Molecular Medicine in Oxford with Dr Chris Norbury. I subsequently joined Prof Adrian Hill’s research group in the Nuffield Department of Medicine at Oxford University. The subject of my DPhil thesis was the development of new antibody-inducing vectored vaccines against the blood-stage of malaria infection. I have since stayed on at the Jenner Institute, first as a Junior Research Fellow of Merton College, and subsequently as a MRC Career Development Fellow. The aim of my work is to develop and translate new vaccine candidates for malaria into proof-of-concept human clinical studies. My group has a particular interest in optimising antibody induction by vectored vaccines, as well as better understanding vaccine-induced immunity to the blood- and mosquito-stages of malaria infection. Simon Drysdale is an NIHR academic clinical lecturer and honorary specialty registrar in paediatric infectious diseases at the University of Oxford and the Children’s Hospital, Oxford. He graduated from St George’s Hospital Medical School in 2003, undertook a PhD at King’s College London from 2008-2011 and completed the postgraduate diploma in paediatric infectious diseases at The University of Oxford in 2015. His main research interests are RSV and other viral respiratory illnesses and antimicrobial stewardship. Dr Katie Ewer qualified as a Biomedical Scientist in 2000 at the microbiology department of the John Radcliffe Hospital before joining the University of Oxford as a Research Assistant. She gained a PhD in Immunology in 2004 through The Open University for her work with Dr Ajit Lalvani in the Nuffield Department of Clinical Medicine on novel diagnostic tools for tuberculosis. In 2004, she joined VLA (now AHVLA) and managed the roll-out of interferon-gamma-based diagnosis for bovine TB in the UK herd for DEFRA as well as undertaking research to study immune correlates of protection for TB vaccines in cattle. Katie joined the Jenner Institute as a Senior Immunologist in 2008 and co-ordinates immunogenicity testing for pre-erythrocytic malaria and Ebola vaccine trials in Oxford and at field sites in East and West Africa. Her work focusses on describing immune responses to viral vectored vaccines in adults and children, identifying vaccine-induced immune correlates of protection and transcriptional profiling of responses to malaria and Ebola vaccines. Andrew Farlow is a Research Fellow in Economics, Department of Economics, and Senior Research Fellow, Department of Zoology, University of Oxford. He is co-PI on Oxford’s new Vaccine Design Institute, with responsibilities for its ‘Vaccine Health Economics’ component, and he is part of the Oxford contingency of the new International Research Consortium on Dengue Risk Assessment, Management and Surveillance (IDAMS). His research interests span the economics of pharmaceutical R&D; measurement of the socioeconomic impact of health interventions (drugs, vaccines, diagnostics, and vector control); global health funding; affordable innovation and technology transfer; application of financial and risk management tools to global health analysis; and market, pricing, launch, and delivery strategies, especially in resource-poor settings. He has advised a wide variety of public and private sector organizations including: WHO; Bill and Melinda Gates Foundation; UK Department for International Development; Aeras TB Vaccine Foundation; TB Alliance; Policy Cures; Médecins Sans Frontières; World Economic Forum; Dalberg, Global Development Advisors; Results for Development Institute; Global Alliance for Vaccines and Immunization; Office of Health Economics, London; UK Treasury; World Bank; Malaria Vaccine Initiative; the UK’s Joint Committee on Vaccines and Immunizations, etc. He is a member of the Stop TB Partnership Working Group on New TB Vaccines: Task Force on Economics and Product Profiles (WHO, Bill and Melinda Gates Foundation, Aeras Global TB Vaccine Foundation). He teaches Vaccine Deployment and Policies for the Vaccinology module of the Oxford MSc in Global Health Science. He was educated at the Universities of Cambridge and Oxford. Paul Fine trained originally in zoology, veterinary medicine, parasitology and epidemiology, and joined the staff of LSHTM in 1976. His major methodological interests have been in infection dynamics, family studies, genetics, and the evaluation of vaccines (efficacy, adverse reactions and impact), applied to a variety of infections. Much of his earlier work concentrated upon vertical (from parent to progeny) transmission of infections and upon measles and pertussis in the UK. He directed a large epidemiological research programme (the "Karonga Prevention Study") in Malawi from 1978-2006, concentrating at first upon leprosy, then tuberculosis, and ultimately HIV, and including demographic surveillance, vaccine evaluation, and studies of other infections in a rural population in northern Malawi. In recent years he has been involved in a variety of vaccine related issues, including evaluation of the transmissibility of oral polio vaccine virus and its implications for the global polio eradication programme, the optimisation of infant vaccination schedules, and methods to evaluate the field effectiveness of foot and mouth vaccines in Turkey and Iran. Dr Gibani studied medicine at the University of Oxford and graduated in 2010. After continuing his training in general medicine he joined the Oxford Vaccine Group in 2014 working on a range of vaccine trials for Ebola virus disease, meningococcal disease and typhoidal Salmonella. He is currently undertaking a DPhil focussing on the use of Salmonella controlled human infection models to better understand infection-derived immunity to Salmonella Typhi and Paratyphi infection, as well as studying the role of typhoid toxin in the pathogenesis of typhoid fever. After a first degree in Biological Sciences at the University of East Anglia, specializing in Microbiology, and a PhD on lipid metabolism in the Biochemistry Department at the University of Hull, Prof Gilbert worked on pentose metabolism in brewing yeasts at the Brewing Research Foundation in Surrey. This led to a research post at the Leicester Biocentre, using molecular biology techniques to study heterologous protein expression in yeast. Prof Gilbert spent four years at Delta Biotechnology in Nottingham, working on production of recombinant human blood proteins in yeast before moving to Adrian Hill’s group at the University of Oxford in 1994. Prof Gilbert’s chief research interest is the development of vaccines that work by inducing strong and protective T cell responses. This has included work on DNA vaccines and virus-like protein particles carrying multiple T cell epitopes on their surface, as well as the viral vaccine vectors Modified Vaccinia virus Ankara (MVA), fowlpox and adenovirus. Following the discovery that heterologous prime-boost immunisation, in which the same antigen is delivered in first one vector and then another, is highly immunogenic in pre-clinical studies, she designed antigen inserts for, and produced DNA, MVA and fowlpox vaccines which were then manufactured for clinical trials in both the malaria and tuberculosis vaccine clinical programmes. More recently Prof Gilbert has begun to apply the same principles of vaccine development, pre-clinical and clinical testing to new vaccines against influenza. The currently available ‘flu vaccines work by inducing antibodies to highly variable surface proteins of the virus, and slightly different versions have to be manufactured each year to keep up with changes in the virus. However the internal proteins of the ‘flu virus, which are produced inside infected cells, are well conserved, not only from one year to the next, but also between seasonal ‘flu viruses and those normally found only in avian species. Using these antigens, it should be possible to make a vaccine that protects against all subtypes of influenza, and ultimately, to stop a new pandemic in its tracks. Simon received his PhD from the Liverpool School of Tropical Medicine, where he developed a cattle model for testing vaccines against onchocerciasis. After post-doctoral positions working on vaccine development for Theilerioses at the Centre for Tropical Veterinary Medicine, Edinburgh, and the International Livestock Research Institute, Kenya, Simon joined the Virology Department of the Animal and Plant Health Agency, Weybridge as a research fellow in immunology. In 2014, he took up the joint position of Group Leader (PRRS Immunology) at The Pirbright Institute and Senior Lecturer in Veterinary Immunology, within the new School of Veterinary Medicine at the University of Surrey. Simon’s research is focused on improving our understanding of the interactions of the PRRS virus with the porcine immune system and the development of improved vaccines. Adrian Hill trained in medicine at Trinity College Dublin and the University of Oxford, qualifying in 1982. He undertook a DPhil with Sir David Weatherall and John Clegg at the MRC Molecular Haematology unit on the molecular population genetics of thalassaemia in Pacific Islanders. Following further clinical posts in London he returned to the newly opened Institute of Molecular Medicine in 1988 to study genetic susceptibility to malaria as a Wellcome Trust Senior Fellow. In 1995 he was awarded a Wellcome Trust Principal Research Fellowship and in 1996 the title of Professor of Human Genetics. He participated in the founding of the Wellcome Trust Centre for Human Genetics in 1994, and in 2003 co-founded the Oxford Centre for Clinical Vaccinology and Tropical Medicine, which he now chairs. In 2004 he participated in the restructuring of the Edward Jenner Institute for Vaccine Research and in 2005 was appointed director of the new Jenner Institute. He is a Fellow of the Royal College of Physicians, of Magdalen College, Oxford, and of the UK Academy of Medical Sciences. Prof Hope obtained a BSc (Hons) degree in Biological Sciences (Microbiology) from the University of Birmingham, UK in 1991, and a PhD degree from the University of Manchester, UK, in 1994. She then carried out postdoctoral research at the University of Manchester (1994-1996) and Kings College School of Medicine and Dentistry (1996-1997). Between 1997 and 2011 Dr Hope worked at the Institute for Animal Health carrying out research into bovine tuberculosis (TB) and immune mechanisms that lead to protective immunity. Dr Hope moved to The Roslin Institute in August 2011. Dr. Kelly is a BRC funded consultant in paediatrics and vaccinology. He divides his time between working in general paediatrics and paediatric infectious disease at the Children’s Hospital in Oxford and vaccine related research within the Oxford Vaccine Group. His research interests are centred around vaccines and vaccine preventable disease in childhood and include the immunology of B-cell responses to vaccines in childhood, B-cell receptor genetics as a tool for understanding immune responses, pneumococcal conjugate vaccines and the epidemiology of invasive bacterial disease and pneumonia in Nepal. Angeliki studied theology and philosophy in Greece, Germany and the UK, and received her DPhil in 2009 from Oxford University. Her research focuses on ethical issues that arise from the introduction of new technologies to, and the effect of socio-economic changes, on global health research and clinical practice. Using philosophical analysis and empirical research, she is examining the ways in which these factors impact on the theory and the practice of professional ethics for biomedical researchers and healthcare staff. Principal areas of research: MVA85A Tuberculosis Vaccine (BCG booster vaccine). Helen McShane obtained an intercalated BSc in 1988, and then a degree in medicine in 1991; both from the University of London. After junior hospital posts during which she obtained MRCP in 1994, she worked as a registrar in Infectious Diseases and HIV/GU medicine for 3 years. She then began a PhD with Adrian Hill in 1997, and was awarded a PhD in 2001, also from the University of London. In 2001 she was awarded a Wellcome Clinician Scientist Fellowship to establish a translational programme of vaccine research evaluating new TB vaccines in the clinic. This fellowship also allowed her to complete her clinical training and she was awarded a CCST in HIV and GU Medicine in 2003. In 2005, she was awarded a Wellcome Senior Clinical Fellowship, which she took up in 2006. Her research team continues with the programme of translational vaccinology, and is involved in developing new assays for monitoring vaccination induced cellular immune responses, developing a BCG challenge model in humans and the aerosol delivery of vaccines. Principal areas of research: virus-induced cancers, molecular mechanisms of oncogenesis, role of virus- and host-encoded microRNAs in oncogenesis, novel antiviral vaccines. Prof Venugopal Nair obtained the Bachelors Degree in Veterinary & Animal Sciences from the Kerala Agricultural University, Trichur, India in 1976. After obtaining a PhD in Veterinary Medicine from the Tamil Nadu Agricultural University, Chennai, India in 1987, he started his research career as a post-doctoral scientist at the Indian Institute of Science, Bangalore. Dr Nair joined Dr Ernie Gould’s group at the Institute of Virology & Environmental Microbiology, Oxford as postdoctoral research fellow in 1989, where he carried out extensive research until 1994 on the molecular biology of arthropod-borne flaviviruses. Dr Nair moved to the Institute for Animal Health in 1994 to join Dr Jim Payne’s group to work on avian oncogenic viruses. He became the Head of the Viral Oncogenesis group following Dr. Payne’s retirement, and since been leading the research on the pathogenesis of avian oncogenic viruses such as Marek’s disease. Dr. Nair is the designated expert of the OIE (Office International des Epizooties) Reference Centre on Marek’s disease and was the Chairman of the organizing committee of the 7th International Marek’s Disease Symposium in Oxford in 2004. He is also a Visiting Professor at Imperial College London since 2005, and is a member of the Board of Editors of Avian Pathology. Prof. Nair became a Jenner Investigator in January 2007. Margaret Stanley attended the Universities of London, Bristol and Adelaide, and is a Fellow of the Academy of Medical Sciences and Honorary Fellow of the UK Royal College of Obstetricians and Gynaecologists. She has a lifetime award for contribution to research on cervical cancer and cervical precancers from the American Society for Colposcopy and Cytopathology (ASCCP) and a lifetime award for achievement from the International Papillomavirus Society. She was a member of the Spongiform Encephalopathies Advisory Committee that advised the UK government on prion diseases (mad cow disease) from 2004-2010. In 2004 she was awarded the OBE for services to Virology. Her research has focussed on how the body defends itself against infections with HPV, how to develop vaccines that prevent HPV infection as well as those that might treat HPV infection. She is a consultant for the companies that market HPV vaccines, MSD, and GSK and for small biotech companies developing therapeutic vaccines. She acts as the invited HPV expert for the HPV subcommittee of the Joint Committee on Vaccines and Immunisation in the UK. Christoph Steffen holds a Medical Doctorate with a specialisation in Public Health and an MSc in epidemiology from the Paris and Versailles Universities and an MSc from Imperial College London. After starting his career in the area of epidemic and pandemic surveillance and influenza with WHO, Christoph Steffen worked for a few years at the European Commission as a project and policy officer in the area of patient safety and health technologies. With AMP, a French nonprofit organization active in vaccinology, he managed the viral respiratory disease programme and was involved in various vaccine preventable diseases projects. He also worked as a public health practitioner in a large general hospital in Haute-Savoie (F) district. Since May 2017 Christoph Steffen is coordinating the Global Vaccine Action Plan secretariat at WHO and is the focal point for the SAGE* Decade of Vaccines working group in the Immunization Policy Unit. Dr Williamson is an experienced immunologist, working in a microbiological context. She has a track record of successful research and has had scientific input to a range of R&D projects, initially in the veterinary vaccine field during her employment with the Agricultural and Food Research Council in the UK. More recently, she has worked in the biodefence field, particularly on the R&D of new recombinant vaccines for plague and anthrax, being involved in both programmes from initiation to clinical trial. Currently she is a Principal Scientist at DSTL Porton Down, contributing to the technical management of a number of projects towards the development of vaccines and therapies for serious human pathogens , with practical input to others. She has authored over 120 peer-reviewed papers and supervised 12 PhD students to completion. An overview of the field of human and veterinary vaccinology, from Edward Jenner to modern day vaccines. An understanding of the immune system and immune mechanisms needed to provide protection from disease. An understanding of the recent advances that have been made in the vaccine field and appreciation of the impact of molecular immunology and pathogen genomics on vaccine development. An overview of the molecular methods used for the design and construction of vaccines. An appreciation of the importance of pre-clinical testing and the many factors involved in the selection of animal models. The ability to understand and interpret the bioassays used to measure vaccine immunogenicity and to understand how immunogenicity correlates with protection. An understanding of the role of veterinary vaccines in animal heath, animal welfare, environmental protection and public health. An understanding of the vaccine development pathway - from bench to market. An overview of the ethical issues surrounding vaccine development and deployment. If you're uncertain whether this course is suitable for your requirements, please contact us with any questions you may have.